We almost saw three bracelets awarded on Thursday at the 2018 World Series of Poker. While Ben Dobson and Filippos Stavrakis claimed their first pieces of WSOP jewellery, John Hennigan and David ‘Bakes’ Baker will return tomorrow to play resume heads-up action in the $10K H.O.R.S.E. Championship. Some other big events played down to their finales, including THE MARATHON which saw some big names reach the home straight. Here’s all the news from June 14. 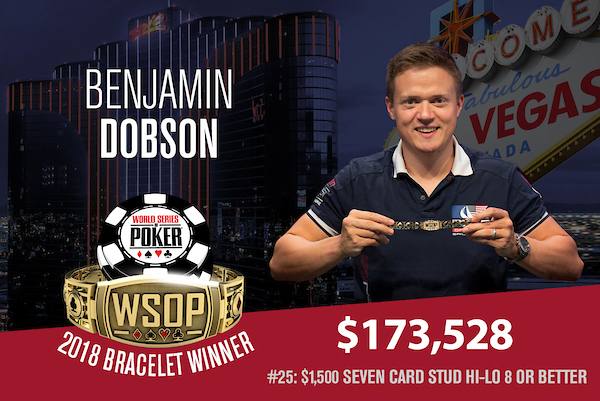 The UK’s Ben ‘f3nix35’ Dobson has taken down his first WSOP bracelet, winning Event #25: $1,500 Seven Card Stud Hi-Lo 8 or Better for $173,528. Only three players returned on Thursday for this one, with Dobson holding a healthy chip lead over Tim Finne and Jesse Martin. The latter of those two came in as the short stack, and despite some early signs of a comeback, he eventually was whittled down to two big bets and couldn’t recover. Martin went out in third, still chasing his third bracelet. Heads-up saw Dobson start with a 3:1 chip lead, and the duel didn’t take long to come to a conclusion. In the final hand, Dobson made a 6-5 low and a straight to scoop the pot versus Finne’s pair of sevens and no low. The second bracelet winner of the day was Filippos Stavrakis, who took down Event #26: $1,000 Pot-Limit Omaha for $169,842. This event attracted 986 total entries, but only 14 returned for this final day with Stavrakis holding the chip lead. Things were going steady, but when play got down to four-handed, Stavrakis found himself with the short stack. He managed to battle back though, defeating Jordan Siegel heads-up, while Brazilian pro Felipe Ramos finished in third. Stavrakis had his wife by his side throughout the finale, and held someone else very special in his heart, as he explained. Hennigan and Baker End Day Heads-Up in $10K H.O.R.S.E. Just two players remain in the prestigious Event #27: $10,000 H.O.R.S.E. Championship, and there’s plenty of experience between them. Four-time bracelet winner John Hennigan and two-time bracelet winner David ‘Bakes’ Baker are the last two standing, but with the stacks quite deep and a long day already behind them, the two decided to bag up and will return tomorrow to play down to a winner. Hennigan holds a monster chip lead though, with 6,675,000 to Baker’s 1,630,000. Baker isn’t to be ruled out though; after all, he won this very event back in 2012. They’re both guaranteed second-place money of $256,297, while the winner will get $414,692. The final day saw the runs of Katherine Fleck (16th -$17,677) , Jean Gaspard (15th – $17,677), Illya Trincher (14th – $20,993), Anthony Zinno (13th – $20,993), and Robert Mizrachi (12th – $24,498) busted fairly early in the day. They were followed not long after by Carol Fuchs (11th – $25,498),Jake Schwartz (10th – $25,498), and Robert Campbell (9th – $31,656) come to an end prior to the official final table. The following players made the finale but are no longer with us: Lee Salem (3rd – $179,216), Iraj Parvizi (4th – $127,724), Randy Ohel (5th – $92,808), Albert Daher (6th – $68,783), Daniel Zack (7th – $52,016) and Michael Noori (8th – $40,155). Event #24: $2,620 THE MARATHON No-Limit Hold’em is down to a final table of nine after four gruelling days of play. It’s Mark Sleet who holds the chip lead with 7,725,000, but he’s closely followed by former Main Event champ Martin Jacobson with 7,345,000. Bart Lybaert sits in third (7,155,000), followed by Michael Addamo, Ihar Soika, Taylor ‘taypaur’ Paur, Anton Morgenstern, Ying Chan, and Cate Hall, who ended with the short stack. Throughout the day we lost the likes of Joe Elpayaa (57th – $9,616), Martin Staszko (49th – $11,329), Lee Markholt (48th – $11,329), Matt Affleck (44th – $13,520), Faraz Jaka (35th – $16,340), and Salvatore DiCarlo (20th – $19,997). Chris ‘moorman1’ Moorman was the first player to exit today, after his pocket kings got outrun by ace-king, which made a flush. The final table kicks off at 1pm Friday, with blinds at 25K/50K and a 5K ante. They’ve all locked up $50,678, but all eyes are on the $653,581 first-place prize. 868 players are now just 20 after Day 2 of Event #28: $3,000 No-Limit Hold’em 6-Handed saw another ten 60-minute levels played out. Ben Palmer had the best day of all, bagging up 1,595,000 for the chip lead when all was said and done. 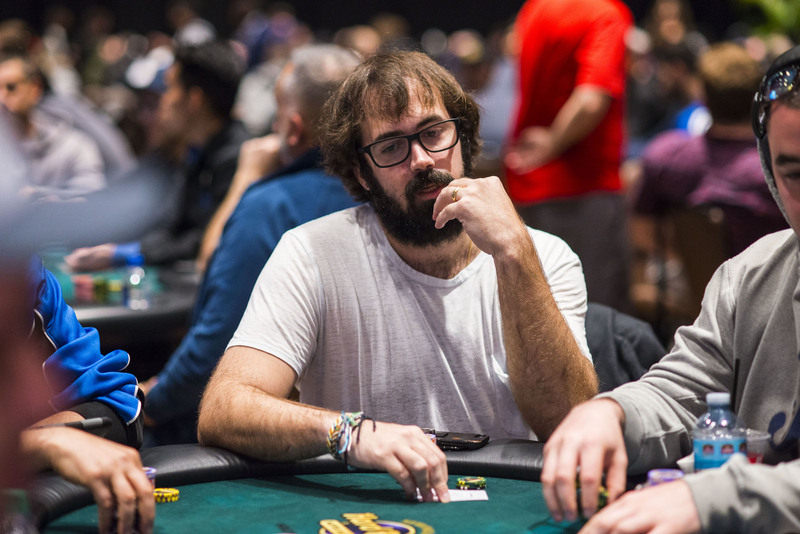 However, it’ll be no easy road to his first bracelet with the likes of Jason Mercier (587,000), Anatoly Filatov (751,000), Ana Marquez (682,000), and Tony Dunst (391,000) still alive. Mercier is the only bracelet winner left in the field, so there’s a good chance we’ll see someone take down their piece of gold tomorrow. Then again, you should never rule out Mercier from anything, who despite a long absence following the birth of his son is showing his game hasn’t lost a thing. Yorane Kerignard (1,219,000), Darren Rabinowitz (990,000), James Mackey (559,000), Gal Yifrach (420,000), and Kyle Hartree (375,000) will also return tomorrow. The same can’t be said for the likes of Ryan Riess (65th – $5,809), Greg Merson (64th – $5,809), Sergio Aido (54th – $6,555), Manig Loeser (52nd – $6,555), Mike Watson (49th – $6,555), Jeremy Ausmus (39th – $8,902), Cliff Josephy (34th – $10,703), Erik Seidel (29th – $13,132), and Olivier Busquet (26th – $13,132), all of whom fell by the wayside today. Action resumes at 12pm Friday with blinds at 6K/12K and a 2K ante. The min-cash right now is $16,435, while there’s $461,798 for the eventual champ. Another tournament close to completion is Event #29: $1,500 Limit 2-7 Lowball Triple Draw. Just seven remain in that one, with Hanh Tran holding the chip lead. He’ll be joined by three-time bracelet winner Brian Hastings, one-time bracelet winner David Prociak, as well as Cody Wagner, Oscar Johansson, Jared Bleznick, and Yong Wang. A total of 86 out of the 356 entries returned for Day 2 today, and throughout the course of action we lost the likes of Philip Long, Andrey Zhigalov, Dzmitry Urbanovich, Scott Clements, Bryce Yockey and Calvin Anderson, to name a few. Some of those who went deep enough to cash include Yueqi Zhu (50th – $2,243), Allen Kessler (49th – $2,243), David “ODB” Baker (40th – $2,485), Jon Turner (39th – $2,485), and Shaun Deeb (19th – $3,799), Phillip Hui (11th – $5,953), Frank Kassela (10th – $7,809), Chris Vitch (9th – $7,809), and Jeremy Heartberg (8th – $10,555). The final seven will return at 2pm Friday, each hoping to win the bracelet and the $117,282 that comes with it. One of two new events to kick off on Thursday was Event #30: $1,500 Pot-Limit Omaha. It had attracted 799 runners when registration closed, but after ten levels just 130 remain. Leading them all is Michael Heritsch with 141,000, while Farid Jattin (111,300) and Jesse Sylvia (92,800) also bagged big. Alas for Phil Laak, Jennifer Tilly, Barny Boatman, Alex Foxen, Craig Varnell, and Connor Drinan, they couldn’t find a bag at the end of the day. It’s still early days in this one, with the bubble set to burst at 120 players. After ten eliminations tomorrow, they’ll be guaranteed $2,255 for their efforts. Six-time bracelet winner headlines the stacks after Day 1 of Event #31: $1,500 Seven Card Stud. He ended play with 70,200, good for the third largest stack behind only co-chip leaders Ron Brown (80,800) and Farhad Mobassery (80,800). There are 88 players advancing from the 310 entries. Mark Radoja and 2017 WSOP Player of the Year Chris Ferguson also bagged up top 10 stacks, with 65,500 and 48,500 respectively. Meanwhile, Bertrand ‘ElkY’ Grospellier, Brandon Shack-Harris, Adam Friedman, Frankie O’Dell, Ben Yu and Carol Fuchs are all still in the hunt. Play continues at 2pm tomorrow, with the bubble set to burst at 47 players. The winner will get $105,629, while a min-cash is worth $2,250. Despite so much going on already, Friday is going to see the WSOP get even bigger. Arguably the most prestigious tournament on the schedule, Event #33: $50,000 Poker Players Championship, kicks off at 3pm, and will see just about all of the game’s very best in action. Meanwhile, Event #32: $1,000 Seniors No-Limit Hold’em will get started at 10am, and Event #6C: GIANT – $365 No-Limit Hold’em starts at 7pm.